Dreampot Review | A Unique Way to Cook. I’ll let you in on just a little secret…. It may (or may not) be true that I’ve become well known in my circle of friends for convincing my children that toasted sandwiches or weetbix for dinner is a great menu choice! The truth is, that I HATE being tied to the kitchen! It doesn’t matter if we’re travelling, I’m preparing camping meals or cooking at home, I get super frustrated having to decide day in, day out what to feed the 5 of us for breakfast, lunch and dinner. So that’s why I need awesome gadgets to help me cook amazing food! We first spotted the Dream-Pot at a Caravan and Camping Show and were instantly excited by how amazing it seemed. We’d never really seen anything like it and weren’t sure if it would be a good investment for our family, as so many things aren’t useful when you multiply by 5 people, but we were assured that this, indeed would cook enough food for our entire family. By the end of the camping show, we were the proud owners of a sparkly new Dream-Pot. Armed with our Dream-Pot and recipe book, we set out to see what delicious meals we could create, and we haven’t been disappointed yet. My favourite meals are ones with rice, because the rice always emerges fluffy and perfect! Remember I said that I didn’t think it would cook enough food for us all? I was wrong! The greatest thing is, that by cooking in the Dream-Pot I know we’ll have enough to go around and I don’t cook too much! Having left overs when you’re travelling can be a real hassle, and I hate wasting food, so this way, Its much harder for me to overestimate the amount of food we’ll need, and if we’re a little hungrier than usual we just add some bread or a salad and it’s perfect! 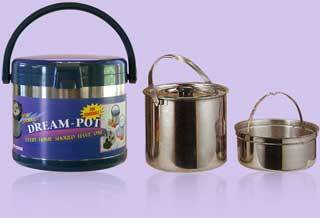 The Dream-Pot is a thermal cooker. This means that it is highly insulated and allows food to continue to cook (or to be kept cold) for extended periods of time without the need for external heating. Depending on the size, your Dream-Pot will have either one or two internal metal saucepans, these are used to start the cooking process, and then transferred into the thermal capsule with the lid closed. Your food will continue too cook itself without risk of overcooking, burning or drying out. Convenient – Prepare and start dinner in the morning, and leave in the Dream-Pot to cook during the day while enjoying your holiday, your dinner will be perfectly cooked the eat that evening. Environmentally Sound – The reduced time needed to initially cook food means using less gas and electricity. It’s a great way to be eco conscious while being convenient. Safe – The Dream-Pot is completely safe. You are able to leave food cooking while you travel on the road. 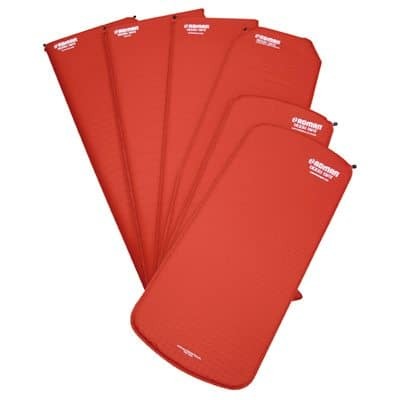 Variety of Usage – Don’t limit your usage to camping trips or holidays. Save yourself time and money on your power bill by preparing dinner hours early and letting the Dream-Pot finish the cooking for you. Another great idea is to use it when entertaining guests and you need to keep things hot or cold, and just secretly, it makes GREAT rice! We love our Dream-Pot, and we’ve used it successfully to cook casseroles, stews, curries, chicken, pasta and desserts and our friends are always amazed. Our Dream-Pot recently went away on a 10 week holiday with my Best Friend with her and her family while they travelled around Australia. It came back wearing stickers to show where it had been exploring 🙂 They used ours for everything for cooking to using as a washing up dish when they had a trailer mishap and couldn’t get into part of their camper leaving them with no washing up bucket! So yes, they are useful and versatile. I must however admit that we did purchase the loaf tin at the last Camp Show we were at (yep you can cook loaves of bread too) but we haven’t had a chance to try it out yet. My final confession is, that even though the Dream-Pot is great for hot and cold meals of all kinds, I still haven’t got into the habit of using it at home, which is my loss entirely!